Join the upcoming GO! Project DD Advocacy Day at the Oregon State Capitol on April 30th. Members of Community Pathways’ team, Build A Movement participants, and advocates will be going. The GO! Project Advocacy Team will be available at the Capitol to give you information, training, and support before talking with legislators. Come be an advocate! Legislator Lookup - Find your legislators (State Senator and House Representative). Three women standing together for a photo at the DD Advocacy Day at the Capitol building in Salem. The woman in the middle holds a sign with the words, “Support DD Services.” Photo taken by Oregon DD Coalition staff member. Oregon Home Care Commission's (OHCC) Registry and Referral System - Find a provider to deliver direct support, or connect with an individual seeking direct support. 211 Info - Find information on food shelters, warming/cooling centers, and shelters. 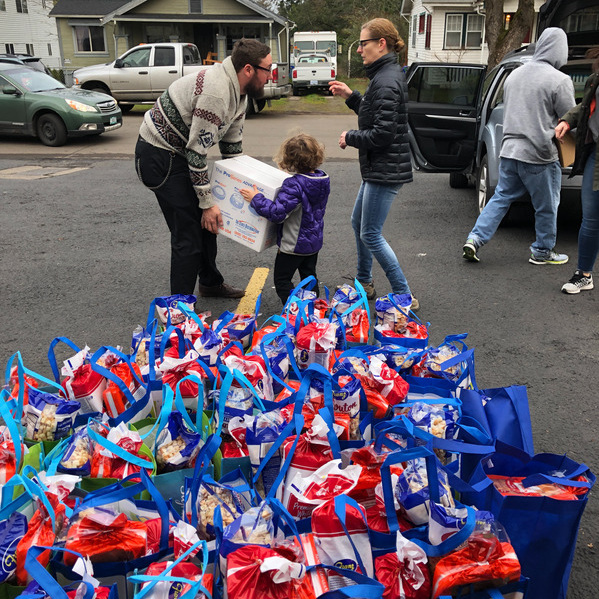 Oregon Food Bank's Food Finder - Find a food bank near you. Portland Farmers Market - many of the markets accept SNAP benefits. Additional Needs Registry - Program for individuals in Portland and Multnomah county to share additional needs with 9-1-1 police and fire responders in case of emergencies. 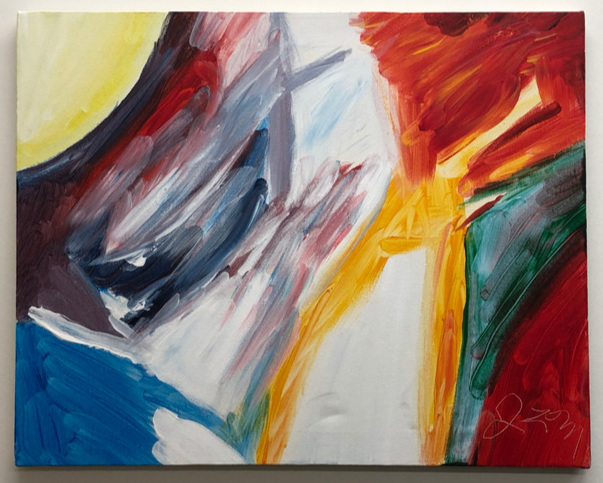 Art Gallery at Seven Corners (2475 SE Ladd Avenue) is currently featuring works by artist Catherine Hill. Please check out the window gallery facing SE Division Street. Public Annex - accessible urban farming and arts programming. PHAME Academy - a school of the arts and performance serving adults with disabilities. Off the Couch Events - socialization and educational program for differently-abled adults. Adventure Without Limits - provides access to outdoor adventure to all people regardless of abilities, socio-economic gender, gender, ethnicity, or age. Guardian Games event calendar - Community calendar of gaming events. 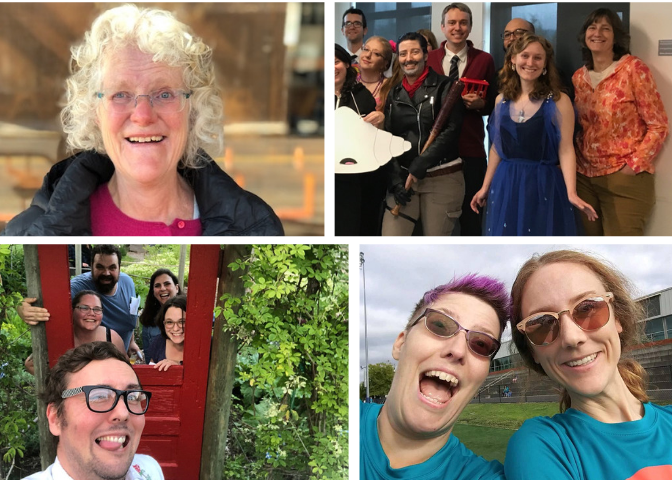 Free Geek - provides volunteer opportunities and classes to enable digital access and education to create community that empowers people to realize their potential. Fidgetech - A community for young adults on the autism spectrum to learn technologies, uncover interests and talents, develop skills, and achieve goals. Do you have a resource you would like us to share? Email Kristine at kolson@communitypath.org or contact a personal agent. Thanks! Spring Photo Gallery - Share your photos with us! Linda, personal agent at Community Pathways. Nina, Fiscal Manager at Community Pathways. The CPI Team is so excited that it's finally Spring. April brings longer days, bluer skies, more frequent "sun breaks", and much needed doses of Vitamin D—and more time spent outside! To celebrate the coming of Spring, members of the CPI team are sharing their favorite Spring-time photos with us all. We hope these beautiful images inspire people to spend time outside and share their photos with us! Want to share your own Spring photos with the community? Please do! 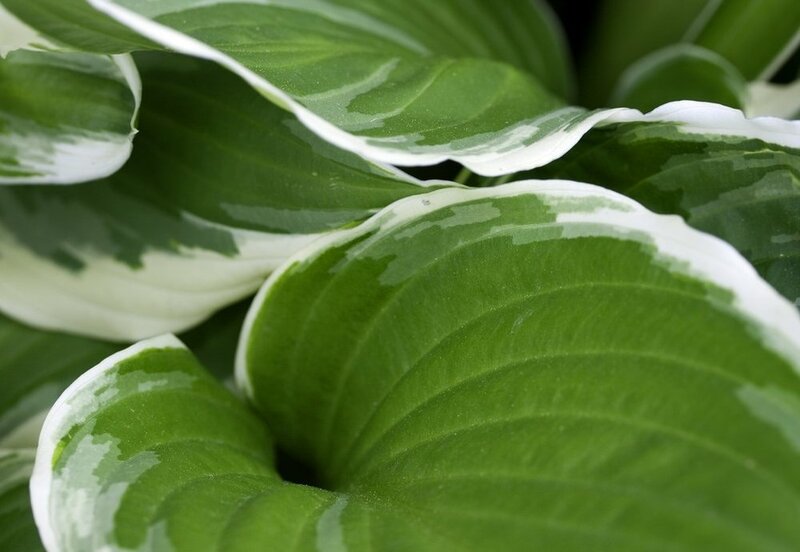 Send photos as .PNG or .JPEG file attachments to kolson@communitypath.org (Subject: Spring Photos for Newsletter). Please include a title or brief description of each photo, such as “Mt Hood View” or “St Johns Bridge”. Sign up to get the Community Pathways Newsletter here. Thank you! Read the latest newsletters below by clicking “Read More”. Want to share your story and be featured in the newsletter or in a blog post on our website? Let us know. We’d love to hear from you. Help us spread awareness about developmental disabilities this month and every month. Follow along with us on Facebook to help us support, advocate for, and empower individuals and families experiencing developmental disabilities in Oregon and beyond. Please use #DDAwareness19 and #support #advocate #empower in your own social media posts. In honor of DD Awareness Month, we’re excited to be sharing the story of Chris and William, an individual and a provider team who volunteer together to collect and give hygiene products (toothbrushes, shampoo, soap, etc.) to people experiencing houselessness in Portland. Learn more about their community service by reading their story below. Thanks for reading! Questions or comments? Let us know. Email Kristine at kolson@communitypath.org or call (503) 935-5243 ext. 228. We value your feedback. Chris and William recently met with our staff to share their experiences as an individual-customer and support provider volunteering together to collect and give hygiene products to people experiencing houselessness in Portland. William, who works as a direct support provider, explains that he started serving people living without a house in Portland by using his own money to buy hot meals for people who might not be able to afford one. With time, his attention shifted to hygiene products because he wanted to provide longer-lasting support to people. By providing people with hygiene products they are able to stay more clean and healthy despite not having direct access to basic amenities. Chris, who is involved in many service projects through his church, quickly joined William's efforts when he learned about them. The volunteer duo share that with the support of Chris’ church congregation they were able to collect enough hygiene products to fill over 100 small backpacks to create what Chris refers to as “hygiene packs.” Targeting areas around the Burnside Bridge and Pioneer Square, Chris says they were able to give most of the hygiene packs away in a short span of time. The pair note the high demand for hygiene products among people living without a house in Portland highlights the larger housing crisis the City is experiencing. Asked if they are still collecting products, or interested in continuing this project together, Chris and William both say yes. They would like to continue providing support to their community in this way, and welcome donations and support in their efforts. Asked if he’s working on other service projects, as well, Chris shares that he regularly volunteers with his church. Primarily, he helps sew and assemble sanitary pads that are donated by the church to an organization in Africa that provides support to women in need. As an aside, William points out that it would be helpful to include disposable sanitary pads in the hygiene packs they make for people living in Portland. What products do Chris and William currently collect for the hygiene packs? In travel sizes, they collect: tooth brushes, tooth paste, mouth wash, floss, shampoo, soap, razors, hand sanitizer, sunscreen, bottles of water, and snacks. Q-tips, toilet paper, nail clippers and disposable sanitary pads are also appreciated. They are also open to suggestions. If you would like to learn more about Chris’ and William’s service project(s), or would like to donate toward their cause, please let us know. 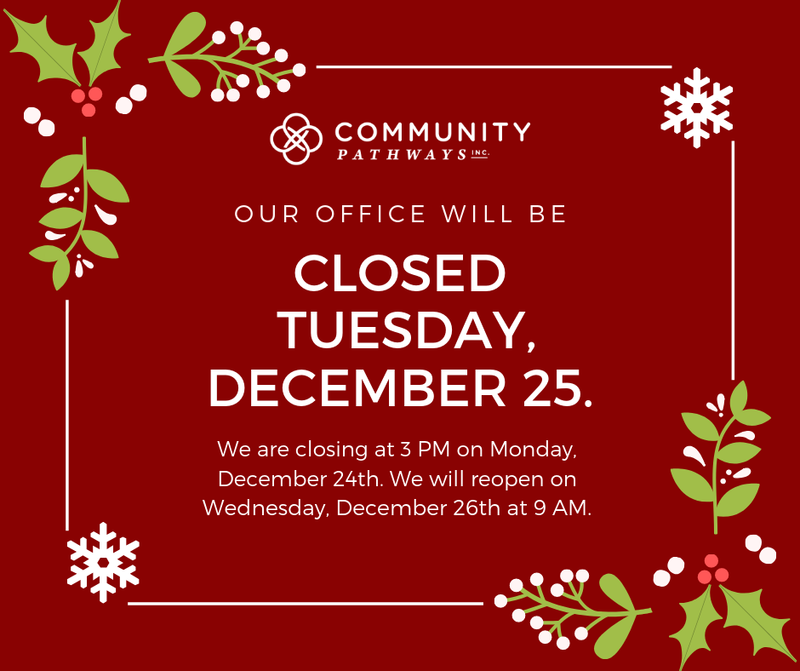 Contact Kristine at kolson@communitypath.org or (503) 935-5243 ext. 228. Join us at the next DD Advocacy Day in Salem on Tuesday, March 5th (10am - 2pm). Community Pathways is joining the Oregon Developmental Disability Coalition's GO! Project Advocacy Team and self-advocates to help support DD rights and services during the 2019 Legislative Session. Come learn about legislative advocacy and how you can make your voice heard! Image description: Build A Movement event flyer. Community Pathways is proud to help sponsor and support the next Build A Movement (BAM) meeting of self-advocates on March 8th. BAM participants are self-advocates living in the Portland area who work together to address issues related to DD Services, Housing, and Healthcare. To learn more about BAM and how to get involved, contact Jennifer Knapp at knapp@cvision.org or (971) 347-7825. Do you like playing board games, video games, Virtual reality, etc.? Let us know by taking a short survey on gaming events. Community Pathways invites individuals-customers to take a short 5 question, confidential survey to let us know if you’re interested in joining a gaming event or group. Our team would love to host a game night or gaming event here at Community Pathways. But, first, we need your feedback! Request a paper copy to be mailed to you, with a stamped return envelope, by emailing Kristine at kolson@communitypath.org or calling (503) 935-5243 ext. 228. You may also contact your PA who can request the survey be mailed to you. Do you have more resource recommendations? Please help us share them with the community. Contact Kristine at kolson@communitypath.org or (503) 935-5243 ext. 228. Thank you! December 2018 Newsletter - Happy Holidays! We moved to the Seven Corners Collaborative in June. We launched a new website. We celebrated CPI’s 10th anniversary as a support services brokerage in July. 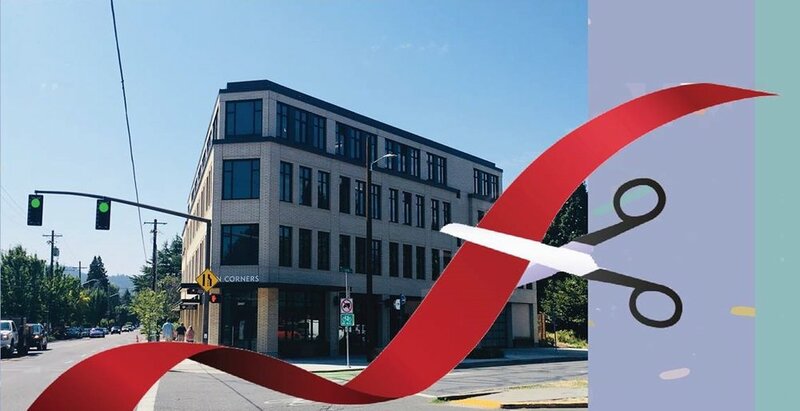 The Grand Opening of The Seven Corners Collaborative in September was a hit. 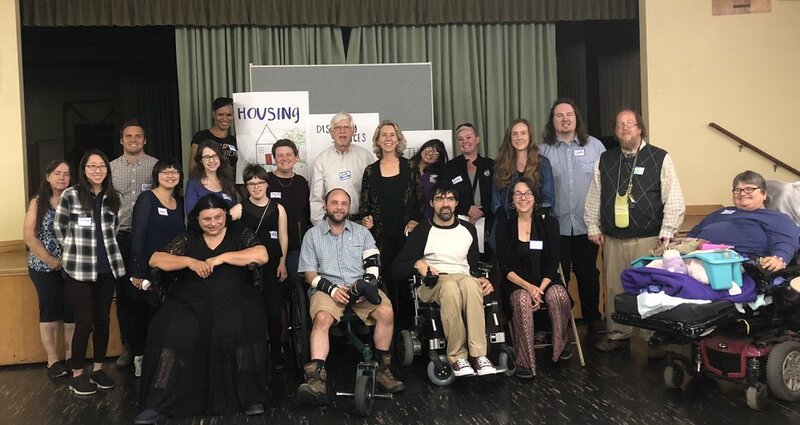 Info fairs and self-advocacy events helped us to connect with more people and resources in the community and share what Community Pathways does as a support services brokerage. Several new staff members were added to our growing team. The introduction of the Oregon Needs Assessment (ONA) led to the creation of three new ONA Assessor positions on our team. We are grateful that two of these positions were able to be filled by existing staff members. Over the course of the past year, we’ve gained over 60 new followers on Facebook, helping us to connect with more people and to make more resources accessible online. Our capacity has grown from serving 450 to 475 individuals. Thank you to everyone who has helped make 2018 an extra special year for Community Pathways. We are grateful for the individuals and community we serve and look forward to connecting with more of you in 2019. Earlier this year, Community Pathways redesigned and launched a new website to help us make the information and resources we connect people with more accessible online. We are also excited to be connecting with more individuals, families and providers through our website and Facebook page. The update was guided by feedback from individuals, providers, and members of our staff and board. This feedback also informs our use of Facebook, which has helped us gain over 60 new followers this year! Please, leave a comment or review to share your experience of us and help more people get to know us better. Thank you! Come visit us at our new location in the Seven Corners Collaborative in southeast Portland. We moved to this new building in June. It is designed to be universally accessible. We are grateful to be sharing this building with our partners Community Vision, FACT Oregon, and the Oregon Council on Developmental Disabilities. Visitors are welcome to tour the Assistive Technology Lab and test out the accessible kitchen. Just ask! Community Pathways' celebrated its 10th anniversary as a support services brokerage in July. We hosted a party and invited the individuals we serve, their families and providers, our staff members, board members, and partner organizations to celebrate with us. It was a fun and meaningful opportunity for the community to gather and create fun memories together. We are grateful for the individuals and community we serve. Thank you to New Seasons-Seven Corners for donating food toward the event. We are glad to have neighbors that want to partner with us and support our mission of assisting people with disabilities to live empowered, self-determined lives through community connections. Thank you to everyone who joined us for this celebration! The Grand Opening of the Seven Corners Collaborative building in September was a success. Over 200 people attended the opening, including some of the individuals we serve, their families and providers. We’re grateful to Teote for generously donating delicious food toward the event. The Grand Opening was a wonderful opportunity to get to know our neighbors, community partners, and the individuals and families we all serve. Thank you to everyone who joined us! This fall, Olivia joined our team as the full-time Administrative Assistant. She is the first person many people connect with when they contact and visit our office. Kaaren, who was recently named Self Advocate of the Year by OSAC, just started her position as Front Desk Support and helps greet people and answer calls when Olivia is away from the front desk. Tracy has returned to our team after living abroad for a year. She provides much appreciated help with filing. Meet our team. The introduction of the Oregon Needs Assessment (ONA) this year led to the creation of three ONA Assessor positions on our team. We are glad to have filled two of the three roles with existing staff members. All three ONA Assessors bring diverse experience and compassion to their positions. More information about the ONA will be provided in 2019. Meet our ONA Assessors. If you have questions, ask a PA or contact us. Community Pathways attended several info fairs and advocacy events this year and looks forward to connecting with more individuals and community partners this coming year. Our goal is to educate more people about support services brokerages, the process of entering into brokerage services, person-centered approaches to support services, the principles of self-determination, and self-advocacy. Multnomah County Information Fair for I/DD on May 1, 2018 was well attended by families and individuals experiencing I/DD who live in Multnomah County. Learn more about Multnomah County DD services. Clackamas County Support Services Info Nights provide an opportunity for ‘transition age’ individuals to learn about adult support services that will become available to them when they turn 18. We also welcome individuals who are 18 years of age and older who want to learn more about brokerage support services. Info nights are held at Clackamas Education Service District. 2018 Division/Clinton Street Fair and Parade. Community Pathways helped sponsor this event and partnered with the Oregon Council on Developmental Disability to staff a booth. We enjoyed connecting with our new neighborhood in southeast Portland, sharing about available support services and self-advocacy opportunities. 8,000 visitors attended this event. Join the fun next summer at the 2019 Division/Clinton Street Fair and Parade! We look forward to participating in these events and more in 2019. Questions? Call Kristine at (503) 935-5243 ext. 228 or email us. 2018 All Ability Tri4Youth organized by FACT Oregon was a major success. Two members of our staff volunteered and had a great time cheering on kids of all abilities in their events. Save the date for the event on August 10, 2019 at the Tualatin Hills Athletic Center in Beaverton. SAVE THE DATE for the 2019 All Ability Tri4Youth will be held on August 10, 2019. 2018 TASH Conference. 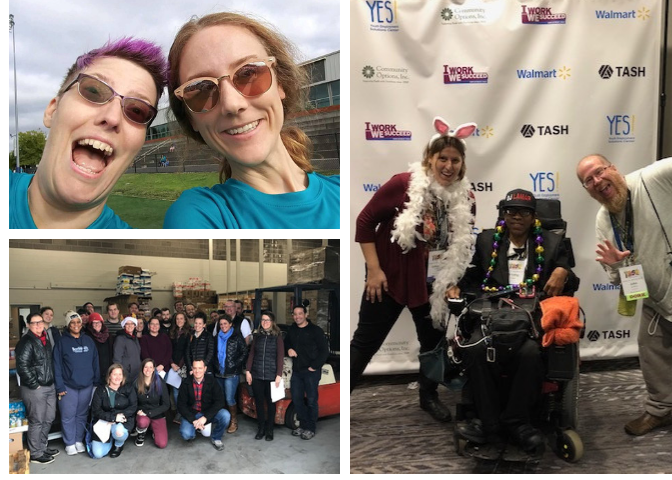 Community Pathways, FACT Oregon, Community Vision, and OCDD helped serve on the Local Host Committee for the 2018 TASH Conference held in Portland in November. Community Pathways sponsored two advocates (one self-advocate and one parent of an individual with a developmental disability) to attend the three-day conference. DDAC Holiday Food and Toy Box Delivery. 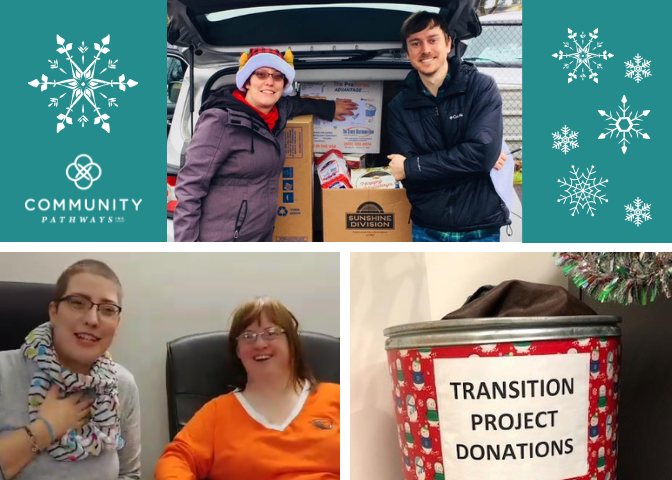 For the past four years, staff members have volunteered to help IDDAC (Intellectual and Developmental Disabilities Advisory Committee), Sunshine Division (Portland Police Bureau) and Toy and Joy Makers (Portland Fire and Rescue) deliver food and toy boxes to individuals we serve. Want to get involved? Call Kristine at (503) 935-5243 ext 228 or email us. We want to hear from you. Please consider sharing your story to help others live a more empowered, self-determined life in the community. Please take a few minutes to leave a comment or review about Community Pathways on our Facebook page. Your reviews and comments help people visiting our page learn about who we are and what we do as a support services brokerage to assist individuals with disabilities to live empowered, self-determined lives through community connections. Please remember: Community Pathways is a case management entity (CME) and support services brokerage. We are neither a provider agency nor the employer of direct support providers, such as personal support workers. We do assist individuals to enroll the direct support providers they choose to help them meet their needs and goals. If you have any questions or concerns, please contact your PA or call our executive director Jennifer Santiago at (503) 935-5243 ext. 244. We appreciate your feedback!